Friends, bloggers, countrymen… Welcome back to the semi-finals for this year’s Blogger Blitz: Black Sheep Edition hosted by Adventure Rules. It was a tough battle, but my sponsored candidate, Marjolaine from Dragon Age: Origins, has prevailed and is now taking on yet another social event: a fiendishly fun movie night! She is facing off against Ganondorf, sponsored by the fabulously talented Teri from Sheikah Plate, so definitely check out her entry for this match as well, and be very sure to tune in to Adventure Rules this Friday for the results of this bardmaster-to-Gerudo face-off! 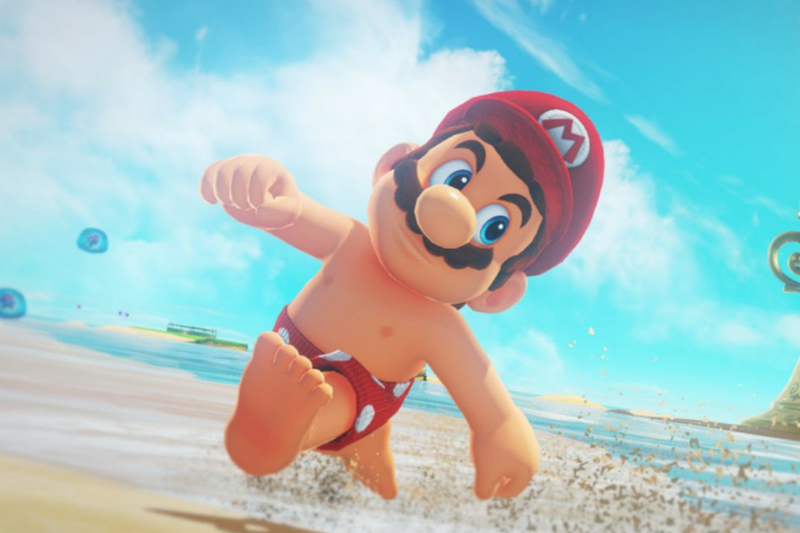 It’s Friday and work this week has been pretty hectic – another upstart hero tried to stop your tyrannical rise to power, the royal heir escaped your wicked clutches, and cosmetic microtransactions were just announced for your favorite video game franchise. Luckily, you’ve got a relaxing weekend planned with your buddies, a movie night complete with snacks, decorations, and total surround sound. At least, that was the plan. Just as movie night is about to get started, your villain realizes discovers that a pack of wererats broke into the cupboard and ruined all the snacks! Now you have to figure out where to quickly obtain more snack food before your friends arrive. Panicking, you look out the window of your beachside castle and see a faint ray of hope: a beach party taking place right outside! All you have to do is steal all their party stuff and bring it to your own party and the night is saved. Bloggers have a lot of creative freedom with this event. Who’s throwing the beach party? How will the villain approach the party to steal the goods? Will the wererats just let this slide? With so many options available, there’s no telling what will happen in this kooky Blogger Blitz event! Marjolaine stepped back and admired her handiwork. It wasn’t quite fit for an Orlesian party, but that overly-large turtle thing she had befriended had seemed anxious to spend more time together, and the blonde woman – Peach? – had suggested a movie night. She sighed. Normally she wouldn’t bother with such a display, but she supposed it was the least she could do after he threw Leliana – forcefully – from the Winter Palace window. She traced a finger down the list Peach had given her for a “successful movie night.” “Cake” had been high on the list, but pastries from Val Royeaux would have to do. She went to the cupboard to get them when snuffling behind the door caught her attention. Deftly pulling a dagger from underneath her sleeve, she wrenched open the door to see wriggling furry things retreating into a large hole in the back of the cupboard. They were too big to be ordinary rats, and they stood on their hind legs. Worse, they had decimated the pile of pastries and left hardly any crumbs behind. “Merde,” Marjolaine muttered. This wouldn’t do. The turtle king was bumbling, but the Maker would take her before anyone thought her to be a poor host in her own home. “I’m sure they won’t miss a few of those boxes of treats,” Marjolaine said with a smile. She glanced up the road; a small green speck was walking next to a pink one. She would have to be fast. She was striding across the sand in no time, carefully avoiding the man still wearing overalls and a red hat. Eying the table full of white and pink boxes, she stealthily blended in – or tried to – with the colorful crowd. A tall man with a moustache grabbed her arm. Marjolaine blinked, unsure how to answer. She was sure that their definitions of “games” were different. But Luigi went on, chattering nervously. Marjolaine’s heart sped up and her glance went unbidden to the boxes on the table. Inside the box was three layers of pastries – not quite Orlesian, but she supposed they would do. And there was plenty; she assumed such a large turtle would eat a lot. Before she could figure out how to take the box, it was being thrust into her hands. “Here,” Luigi said with a little smile. “There’s a lot to-a choose from-a, and-a…” He suddenly looked distracted. “Excuse-a me… Hey, Daisy!” And he hurried off, leaving Marjolaine standing stunned with a huge box of pastries. Was it really that easy? She snagged two more, leaving the empty boxes behind. She glanced around and grabbed the festive napkins and plates, but otherwise it was a very simple party. And she wasn’t about to carry a rickety table back to the Winter Palace. Marjolaine kept her face carefully blank as a flutter of annoyance rose in her. But these people from the Mushroom Kingdom – within a place called Nintendo – were much different than the people she knew, and the large turtle thing had proven useful once. Now there were more of these Nintendo people around, so it might do well for her to keep him happy. “Yes, of course. I… will be right back,” she said with a smile that didn’t reach her eyes. There was enough food for everyone; must he be so picky? She started to leave the parlor when growling caught her attention. With a groan of frustration, she pulled the dagger from under her sleeve again. From behind the cupboard door burst four humanoid-like rats, their red beady eyes fixed on Marjolaine. With a cry, she fell on them as dexterously as she could, twisting through the creature’s claws with grace. She felt claws graze her back, but as she turned and thrust her blade up toward the creatures neck she saw another clawed hand grab it around its middle and slam it to the ground. Marjolaine managed to not look away as Bowser bore down on it. Bowser didn’t respond, but turned and tackled another one of the large wererats. Seeing that the large turtle thing had everything under control, Marjolaine seized the opportunity and slipped away. After all, what better timing than for him to finish off the wererats only to see her standing there with his desired cupcakes? Her second pass to Mario’s party was much more careful. After all, she had taken all the full boxes of pastries and their paper products, and did not have time to engage in another battle of wits with the man with the red hat as she looked for cupcakes. But the guests were busy playing a game in the sand, and with a small smile she sidled up to the snack table again, opening and closing box tops until she found one with an array of cupcakes inside. Marjolaine closed her eyes for a moment before turning and smiling at the redhead that had seen her approach and followed her. Leliana’s eyes hardened. Marjolaine continued before she could speak, tutting a little. Leliana frowned. Marjolaine smiled easily. Marjolaine fought the urge to glance back toward the castle. She needed to get back. “Perhaps,” Leliana said lightly. “You’d like to tell me why you are here, alone, sifting through the pastries? Looking for something? Another attempt on an innocent’s life?” Her voice was rising. Leliana watched her carefully, not sure if she should believe her or not. Suddenly an elf with tattoos on her face in a Grey Warden tunic appeared. Marjolaine groaned inwardly. Just what she needed: the Hero of Ferelden to show up. “Marjolaine,” the elf clipped. Her eyes fell on the box in Marjolaine’s hands briefly before glancing back into the dark eyes. A few silent moments passed as they all looked at each other, each calculating. Finally the elf sighed. Marjolaine clenched her jaw, but the elf was grabbing Leliana’s arm and steering her back to the party. Marjolaine exhaled and waited until the pair were engaged with the other guests before darting away. She returned to the Winter Palace and saw a pile of charred wererats a few meters from the front door. Hurrying past them, she quickly made her way up the stairs to the parlor. She found Bowser reclined on one of the couches, powdered sugar dusted across his snout and grinning a huge, toothy grin. Peach sat next to him daintily, eating a sugared cookie. With little ceremony, Marjolaine plopped the cupcakes onto the table. Although still annoyed at the ordeal, she couldn’t help but smile at how the turtle thing’s eyes lit up when he saw the box. Peach laughed as she watched him settle back onto the couch with three cupcakes in each of his huge paws. “So… a movie?” Marjolaine offered, looking at the foreign objects set up against one of the walls. Licking icing off his claws, Bowser produced a book-type thing. Marjolaine read the cover. She sighed. She wasn’t sure what this whole movie thing was, but she was sure it was going to be a long night. I hope you enjoyed the story, and be sure to check out Adventure Rules (linked above) on Friday for the results! This is so good! I love that you continued from where your first event left off and continued incorporating the same characters. It gives the feeling of building up to something grand. We’ll see how the judges feel on Friday! Good luck! Anything can happen! Your post was fabulous!!!!! Blogger Blitz is back from a short hiatus, and our first semifinal match is already underway! If you missed Athena’s argument for Marjolaine in the Movie Marauders event, now’s your chance to check it out before the results are posted this Friday! Yeah… Quite a disappointment, of course, but I’m glad it made you smile!